Sarah Eliza Boyd was the second child and oldest daughter of James Hervey Boyd and Eliza Ellis Boyd. She was born January 5, 1847. She was called Sallie and must have been named for Eliza Boyd’s mother, Sarah (Sallie) Morehead Ellis. 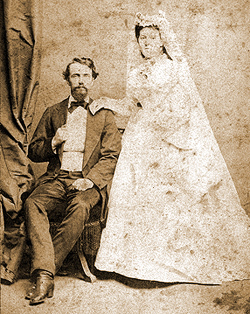 On December 14, 1870, Sallie Boyd married Lyman Cephas Gunn at the Presbyterian Church in Jackson. The Reverend Dr. John Hunter officiated. Sallie’s husband, Lyman Gunn, was born in Nashville, Tennessee in 1846. He was the son of Dr. Lyman Taft Gunn of Nashville, a dentist, and his first wife, Caroline M. Morehead, a cousin of Sallie Morehead Ellis (the mother of Eliza Ellis Boyd and grandmother of Sallie Boyd Gunn). Dr. Gunn was a native of Boston, Massachusetts. In 1875, Dr. L. T. Gunn, advertised his dentist office in The Jackson Daily Clarion. The office was on Capitol Street, opposite the Episcopal Church. In the Civil War, Lyman C. Gunn served in the Confederate Army. He was a member of the 34th Infantry, Company F, from Tennessee. The Federal Census of 1880 shows the family to be living in Fort Worth. Lyman C. Gunn reported his occupation, “railroad agent.” He and wife “Sarah E.” (“keeping house”) had children Daisy, James Boyd and Mineola. They also had a servant from Mississippi living with them, a white female, age fourteen, Katherine Katz. In 1910, Lyman C. Gunn was an auditor for the railroad, living in Nashville with wife Sallie and daughters Daisy and Carolyn. Both daughters were listed in the census as stenographers for an oil company. Lyman C. Gunn died August 18, 1914, at Nashville. In 1920, the widow Sallie Gunn was seventy years old and living in Nashville. In the 1930 Federal Census, Sallie Gunn was included in the occupants of the Boyd family home with Mary Boyd McGill and her daughter in Jackson. Sallie was eighty-two at the time. Mary Boyd McGill was eighty years old, and her daughter Mary E. McGill was forty. The three ladies were joined at the time by a boarder named Alva Marshall, age thirty-five, single, and bookkeeper for Tucker Printing Company. 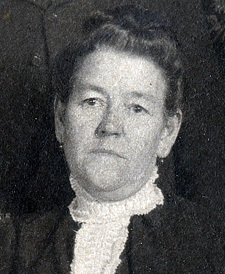 Mary E. McGill was employed as proofreader at Tucker Printing Company. Sallie Boyd Gunn died September 30, 1944, in Nashville. She was ninety-seven years old. A tribute to her in the records of the 51st Annual Convention of the United Daughters of the Confederacy stated that, next to her church (the Westminster Presbyterian Church in Nashville), the cause of the Confederacy was closest to her heart. She was buried near her husband in Nashville City Cemetery. Sallie and Lyman had six children. The oldest, son Lyman Buckner Gunn, died shortly before his fifth birthday. He was born on September 19, 1871, and died in Jackson on August 18, 1876. He is buried in the Boyd family plot in Greenwood Cemetery beside his grandparents. Sallie and Lyman’s first daughter, Daisy M. Gunn, was born on February 22, 1873, in Jackson. Daisy Gunn married Clyde Ezzell at the Moore Memorial Presbyterian Church in Nashville, Tennessee, on December 14, 1923. Daisy Gunn Ezzell worked for Standard Oil Company in Nashville. Daisy Gunn Ezzell was a member of the Daughters of the American Revolution (DAR National Number 372928). Her patriot was Turner Morehead of Fauquier County, Virginia. Daisy Ezzell died on June 30, 1972, and was buried in Spring Hill Cemetery, Nashville. James Boyd Gunn was born in Jackson on April 5, 1874. He married Bess Ralston on April 1, 1912, in St. Louis, Missouri. He died of typhoid fever in 1953. Daughter Mineola Gunn was born May 5, 1876, in Mineola, Texas. She died in St. Louis on October 7, 1897, only twenty-one years old. Ellis Morehead Gunn was born January 9, 1881, at Fort Worth, Texas. 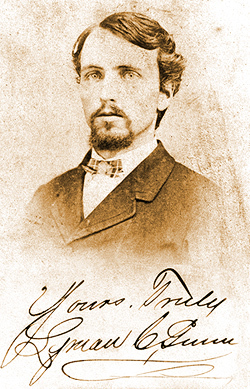 He died in Nashville on November 6, 1902, at the age of twenty-one. Carolyn (Carrie) Gunn was born October 22, 1887, at St. Louis, Missouri. Carrie married William Elbert Davis on November 16, 1910, at the Moore Memorial Presbyterian Church in Nashville. They had a son, Lyman Thomas Davis, born November 3, 1914, and a daughter, Carolyn Murray Davis, born October 9, 1920. Carrie Gunn Davis died on August 11, 1972. Carolyn Murray Davis had joined the Daughters of the American Revolution on February 1, 1969 (DAR National Number 539683). Her patriot and ancestor was Turner Morehead of Fauquier County, Virginia. Sallie’s grandson, Lyman Thomas Davis, married Lenna Coles on August 3, 1940, at the Russell Street Presbyterian Church in Nashville, Tennessee. Lyman Thomas Davis died in June 1984 in Madison, a suburb of Nashville, Tennessee.